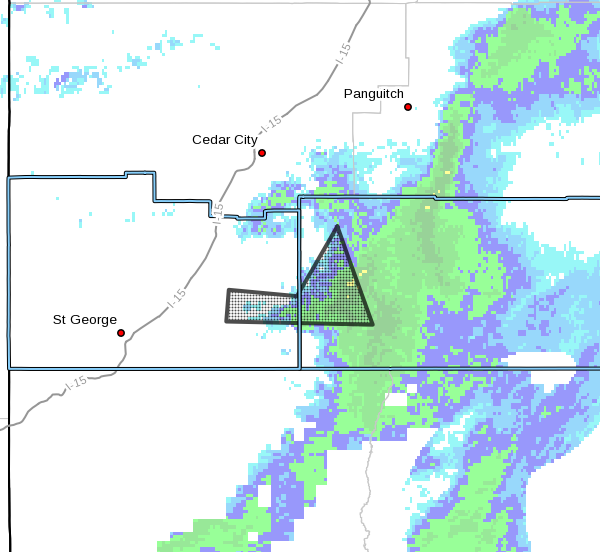 ST. GEORGE – The National Weather Service has issued a flood warning for west-central Kane County and east-central Washington County until 4:30 p.m. Monday. At 9:31 a.m., officials in Zion National Park reported flooding along the north fork of the Virgin River and through many of the slot canyons in the park. Additional steady rain and higher elevation snowmelt will result in further increases in flows along the north and east forks of the Virgin River and through the mainstem of the river to near Hurricane. Some locations that will experience flooding include Zion National Park, Virgin, Orderville, Springdale and Rockville. Flooding is occurring or is imminent. It is important to know where you are relative to streams, rivers or creeks that can become killers in heavy rains. Campers and hikers should avoid streams or creeks. Flash flood waves, moving at incredible speeds, can roll boulders, tear out trees, destroy buildings and bridges and scour out new channels. Killing walls of water can reach heights of 10-20 feet. You will not always have warning that these deadly, sudden floods are coming. When a flash flood warning is issued for your area or the moment you first realize that a flash flood is imminent, act quickly to save yourself. You may have only seconds. Most flood deaths occur in automobiles. Do not drive your vehicle into areas where the water covers the roadway. Flood waters are usually deeper than they appear. The road bed may not be intact under the water. Just 1 foot of flowing water is powerful enough to sweep vehicles off the road. If the vehicle stalls, abandon it immediately and seek higher ground. Rapidly rising water may engulf the vehicle and its occupants and sweep them away. Do not hike alone, and always tell someone where you and your buddy and others are going. Get out of areas subject to flooding, including dips, low spots, canyons and washes. Avoid already flooded and high velocity flow areas. Do not try to cross a flowing stream on foot where water is above your knees. During any flood emergency, stay tuned to your NOAA weather radio, commercial radio or television. Follow St. George News at STGnews.com and St. George News Facebook for weather alerts and updates relevant to Southern Utah. Information from the National Weather Service and disaster and emergency services may save your life.